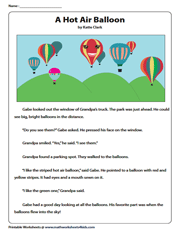 Welcome to the first-grade reading comprehension printables! Give kids a glimpse of literature, and informative texts. Kids answer questions about key details in texts, retell stories, describe characters or settings, identify words that appeal to the senses, understand spoken words and look for reasons to support arguments. 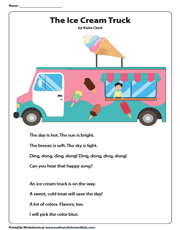 The reading comprehension worksheets feature stories, poems and informative passages carefully chosen to strike a chord with the kids of grade 1. A cup of scrumptious ice cream on a hot day; sounds great, isn't it? 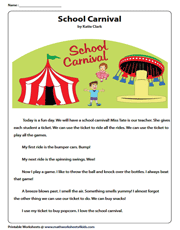 This comprehension worksheet PDF facilitates kids with an easy ride through certain words, phrases and questions on specific details. Despite being small creatures, snails are astonishing. 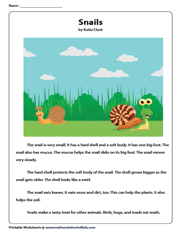 This reading worksheet on 'Snails' for first grade gives kids a hands-on experience with antonyms, free response and finding key details. Alice is on cloud nine as Mommy has a treat in store for her. 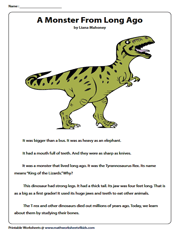 Give your child a head start on true/false, multiple choice and elicit responses on key details with this story reading comprehension worksheet. A child's life would be in peril, if it's not for Mommy dear! 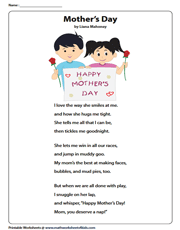 Answering questions about key details in the passage constitutes most of the worksheet following this delightful Mother's Day poem. Have you ever observed the clouds and their changing shapes? Join Josh and Katie and have fun looking for animals in the clouds. The PDF helps refine skills in comprehending the vital ideas in the text. Had the colossal T-Rex lived longer, it'd have been a different world. 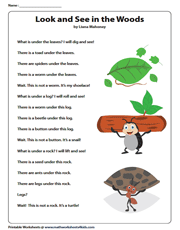 With this grade one reading practice, kids have a ball attempting some questions specified by common core standards for informational text. 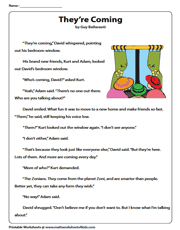 With stories of Zonians, David holds Kurt and Adam spellbound and I'm sure the kids are going to love the story too. MCQ, T/F and specific detail questions have been included to test comprehension. How about a trip in the hot air balloon? Ride on with Gabe and enjoy the perfect trip. 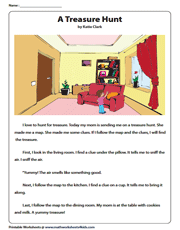 In this reading comprehension worksheet, kids are expected to answer a variety of questions. This is a greatly nostalgic article which kids will enjoy. Here, along with MCQ and open response, the child gets an insight into sequencing; all of which form the core of literature standards set for grade one. Let's follow the clues with the kid and hunt the treasure. Help your kids give their best shot with specific details and open response questions, using this printable reading passage worksheet. In this beautiful poem, the child is thrilled as every time she looks, she finds something new. 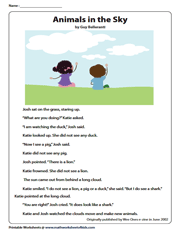 This 1st-grade reading comprehension worksheet contains basic questions and an exercise to practice plural nouns.